This category is to be used for posts about collections issues. Next time you visit the Library, please drop by our new Open Access Wall of Fame, located on the main floor of the Library, near the Research Help area. The Wall of Fame provides us with an avenue to acknowledge and support Ryerson faculty who consider open access avenues when publishing their work. Open Access material is scholarly work that is made legally available with no restrictions so that anyone can access the full text. RULA supports open access through our Digital Repository, an online space for collecting, preserving, and providing online access to research and teaching materials created by the Ryerson community. 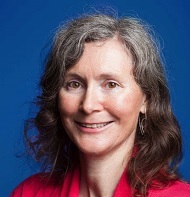 Catherine Middleton is a professor with the Ted Rogers School of Information Technology Management (TRSM), a current Canada Research Chair, and a consistent contributor to the Library’s Digital Repository, a space for collecting, preserving, and providing online access to research and teaching materials created by the Ryerson community. Upon her induction to the Open Access Wall of Fame, Professor Middleton made the following statement: “Publishing work in open access venues like the RULA Digital Repository is crucial to make academic research accessible to broad and diverse audiences, including policy makers, students at all levels, and interested citizens.” Read more about Catherine here. Dr. Harald Bauder is the Academic Director of the Ryerson Centre for Immigration & Settlement and a Graduate Professor in Immigration & Settlement Studies and the Department of Geography. Dr. Bauder co-authored a report, “Toronto’s Little India: A Brief History“, which is available in RULA’s Digitial Repository. This report has been viewed 11592 times, and downloaded 611 times, and is the most popular item in the repository. Dr. Enza Gucciardi is an Associate Professor in the School of Nutrition and an Affiliate Scientist with the Toronto General Hospital Research Institute. She has written over a dozen publicly-accessible manuscripts on diabetes research, many of which are accessible in RULA’s Digital Repository. In an effort to mitigate the effects of repeated budget reductions, inflation and the weakened Canadian dollar, the library has found that it needs to reduce base collections expenditure. After a great deal of analysis and consideration, we have deduced that the cancellation of Business Source Elite and Academic Search Premier, both EBSCO aggregator databases, will have the least adverse impact on the Ryerson community at large. 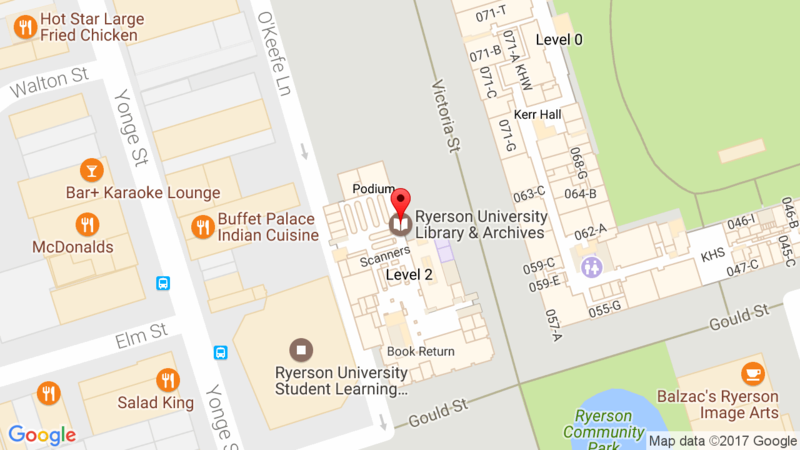 Access to these resources via Ryerson Library will cease as of March 2016. In 2011, the library introduced the Search Everything feature, which is a tool that allows users to search across several databases at once. Consequently, we have seen a marked decrease in Business Source Elite (-63.7%) and Academic Search Premier (-72.8%) searches over the last four years. With significantly decreased usage coupled with annual increases in price averaging 3-4%, the library has determined that we are no longer seeing value for this investment. We understand that you may have concerns about loss of content. Please speak directly to your subject librarian to discuss alternative modes of access. This is not a decision that was made in haste or without careful examination of evidence to support it. Faced with the current fiscal reality, it is a decision that we feel will have the least negative impact on our large and diverse community’s information needs. If you’ve ever tried to compete for the latest pair of Adidas designed by Kanye, or lusted after a Birkin bag that you’ll never be able to afford, then you are already familiar with the concept of artificial scarcity. Brands market high end goods as limited editions in order to drive up the price and the demand. It creates exclusivity and buzz around a product. How, then, does this same marketing ploy weave its way through the world of information buying and selling? Isn’t online content as easy as a ‘click’ to access and share? How can a limit be placed on something that isn’t actually tangible? Leave it to the experts – the folks at Harvard Business Review (HBR) have managed to do exactly that. Ryerson subscribes to HBR both in print and electronically via the EBSCO database, Business Source Elite. EBSCO has exclusive distribution rights for HBR. The HBR 500, as it’s come to be known in the information world, is a collection of the 500 most read HBR articles (as determined by HBR). In 2013, HBR made these articles “read only”, meaning they could no longer be used as course readings unless the library agreed to pay an outrageously priced supplemental fee, on top of existing subscription fees. This fee ranged from $10,000 to as high as $200,000. We chose not to pay. Sure, you can still find those articles via Business Source Elite, but you can’t link to them, download or print them. Exclusivity when it comes to scholarly publications is bad for libraries and bad for students. It hinders access when we should be moving toward open access. It drives up prices for artificial reasons and creates further strain on library and university budgets. What works well in the commercial world is not necessarily contributing to the greater good. Altruistic though it may sound, librarians are on guard to monitor these tactics, lest they set precedents for the rest of the publishing sector. American Library Association. RUSA/BRASS Statement on Harvard Business Review Pricing & Access. November 8, 2013. Gans, Joshua. “Harvard Business Review should pay a price for its fees.” Financial Times. October 16, 3013. Narayandas, Das. “Harvard Business Review Answers its Critics.” Financial Times. October 17, 2013. Ojala, Marydee. “Libraries and the Harvard Business Review 500.” Information Today, Inc. November 21, 2013. Aside from the obvious (TV shows and journals are produced and distributed at semi-regular intervals and continue until they’re cancelled, quality from title to title varies widely, as does the viewer/readership), there are many similarities in terms of how these cultural objects get packaged, sold, and consumed. Have you ever wondered why the library sometimes offers several links to the same online journal? Consider how you get your TV shows in today’s world of streaming services. Let’s talk about journal aggregators, subscriptions, Netflix, and iTunes. For $8 a month, Netflix subscribers have access to an ever-changing selection of TV shows and movies. Are all of these shows “good”? Would you pay for all of them separately? If they asked you, would you say you want all of these titles? You have no control over what’s there. If you’re like me, you keep subscribing to Netflix because it offers enough titles that you want. Often, Netflix doesn’t have the latest season of the show you want to see most. Sometimes stuff you had on your watch list mysteriously disappears. If you’ve met Netflix, you’ve met our journal aggregators. A couple of their names are EBSCO and ProQuest. With aggregator products, the library pays a subscription, but has no control over which publishers’ journals are carried. Most popular and important publishers are often included in aggregator products with an “embargo” – just like missing the latest season of a show on Netflix, you often won’t find the most recently published articles in an aggregator. 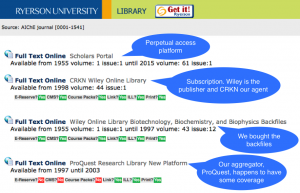 Because EBSCO and ProQuest are competitors in a relatively narrowly defined market, there tends to be a lot of overlap between them. The library has to continually review the value we derive from them and decide whether the unique content provided is worth the money, especially given that subscription rates raise each and every year. So what do you do about those shows you can’t wait to watch? 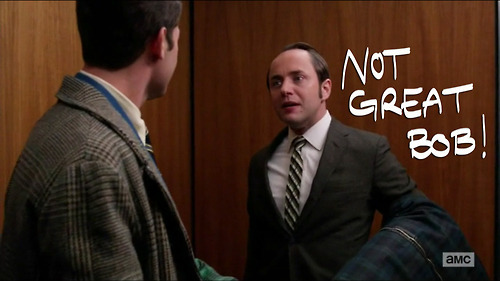 This librarian is addicted to Mad Men. I just can’t wait for Netflix to get the current season, so I buy the season passes on iTunes. At ~$30 for a season, it’s a premium subscription compared with Netflix, but I know I’ve bought that show specifically, and will have immediate access to the episodes as soon as they’re released. I also know that I continue to have access to all of the episodes that are part of that season. They’re not going anywhere. I’ve bought them. I can bug Apple to restore them if they disappear from my account. This is exactly like our individual journal subscriptions. We pay a subscription agent who gives money directly to the journal publisher, and we have access to that title for as long as we continue to subscribe. Even after our subscription ends, we are usually also entitled to keep access to the years subscribed. This is called “perpetual access” and is like those purchased shows you have in your iTunes account. It’s definitely the more expensive route, but it’s also much more reliable. The library gets a share of the university budget for base operations. In 2012/2013 (most recent CAUBO data available), this was 3% of the total university budget. Approximately 35% of that operations budget (roughly $4 million) is dedicated to growing our library collection. Since 2009/2010, like all other departments, we have also had to factor in the necessary budget reductions in our annual budget plans, averaging 2%-3% base reductions each year. Regularly, we struggle with making sure ends meet as we see annual inflationary increases from the publishers to whom we are beholden to provide access to the top tier journals in academia. In 2015, that increase was projected to be 6.1%. In years past, particularly in 2011 and 2012, when the dollar was hovering toward par, we enjoyed increased purchasing power. Despite our piece of the pie shrinking, we managed to keep pace without too much effect on the community (i.e. cancellation of resources, as has been the case elsewhere in the province) through strategic purchasing and use of one-time-only money. And then … the economy threw us for a loop. Despite our best efforts at planning for a worst case scenario, we didn’t quite expect this. In recent months the Canadian dollar tumbled to a low point of .73 (January 30, 2015). The effect on the library’s collection budget is substantial. The majority (approximately 70-75%) of our electronic resources and our monographs are invoiced in US dollars. The price tag for an already expensive journal just got way more expensive. We still don’t know what the long term effect of this will be on the library’s bottom line. We were lucky to have paid many of our invoices earlier in this fiscal year when the exchange rate was more favorable. But if we now have $500,000 USD worth of of outstanding invoices at this point in the fiscal calendar, we’ll end up paying over $620,000 CAD!